Nassau is the first port of call when cruising down to the Caribbean from Florida. There is so much to this little island. Enjoy family fun, historical tours and architecture, lush countryside and most of all the welcome and friendliness of the locals. The Caribbean’s biggest water park has rides that will amaze you. One of the attractions appropriately named the Mayan Temple consists of five different slides. The most notable is the Leap of Faith. This is a 60 ft drop slide into a shark filled lagoon. If you need to slow your heart rate down after surviving that slide, you can take it easy on the lazy river. The park has a total of 20 swimming areas which include three dedicated children’s pools. The official name of this area is Salt Cay. 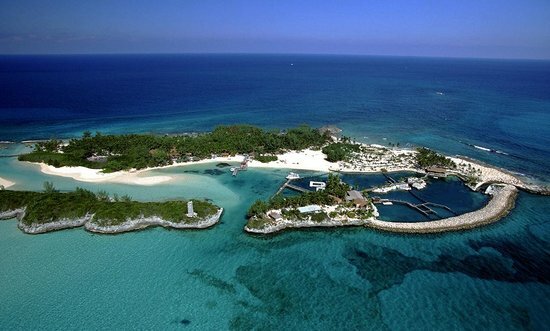 Take a boat ride to Blue Lagoon Island to experience the Bahamas in it’s natural beauty. The boat takes you past the historic harbor and to a private tranquil idyllic island. Here you can experience dolphins and sea lions in their natural habitat as well as exploring the island or spending a relaxing day at the beach. One of the two most popular beaches for visitors to the Island, Cable Beach offers the powdery white sand and turquoise waters that you are looking for. The Bahamas 700 cays makes this a perfect place for snorkeling. The most regular sighted fish is the grouper, followed by yellow tail snapper, parrot fish, queen angel fish and trumpet fish. Constructed in 1793 using cut limestone, the fort was strategically placed at the peak of Bennet’s Hill. From this vantage point the island was able to protect its town and harbor from any possible threats. Not just a staircase, this most popular attraction on the island has lush foliage with a waterfall and guides to tell you all about the history of the construction. An absolute must see when visiting Nassau. This cool tiki bar serves drinks in true Caribbean style. They have plenty of drink special offers, an extensive food menu and even offer free wifi. The atmosphere is so authentic you will want to hang out for a while. Using traditional English rum-making methods, John Watlings Distillery produces it’s own rum which is known as the “Spirit of the Island”. Take a tour of the distillery and learn how the rum is made and find out about the pirate himself and the tale of his untouched buried treasure. Wander around the lush tropical gardens and meet the flamingos and parrots among other resident animals. Learn about the conservation efforts of the zoo and the endangered species it is working to protect. This stunning church building is one of the top places to visit in Nassau. It is the Mother Church to all Anglican churches in the Bahamas. The cathedral is made of cut lime stone block, mostly held together by gravity not cement. The building’s feature is its east window depicting the crucifixion, the empty tomb and the ascension.